MW Mobile Blog: I am going to BenioffLand! 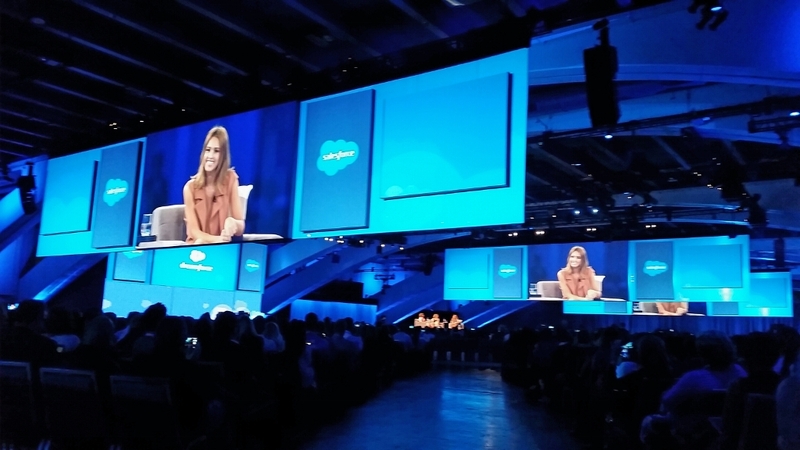 In what has become an annual pilgrimage, I strolled down the hill to collect my free registration badge and gaze in wonder and awe at the spectacle that is DreamForce 2015. The annual rock show, charity benefit, technology conference, social awareness pontification platform, celebrity worship, publicity spotlight for every progs favorite CEO, new age mindfulness mysticism and conspicuous excess extravaganza has once again taken over the EssEff Convention Center complex. As per usual, all intersecting streets and practically every venue and restaurant in a two mile radius were dedicated to the show. I don't know when the DreamForce user conference event completely untethered from the very successful but rather mundane software application company SalesForce that sponsors it, but there it is - an event like a hot air balloon floating into the sky unrestricted by earthbound restraints of profitability or shareholder value, with only the most tenuous connection to the actual product that SalesForce sells. I've given up trying to understand it. Perhaps, like Burning Man, it is an event that exists outside the realm of rational explanation. 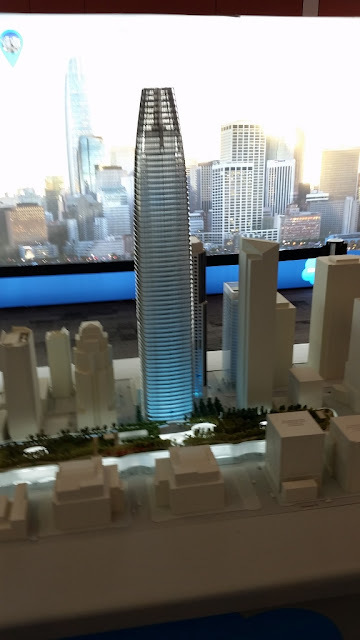 Something to simply experience, to roll around in the wind blown dust of shareholder profits, take it all in, and bask in the beneficent fire of the marketing genius and force of personality that is Burning CEO Marc Benioff. 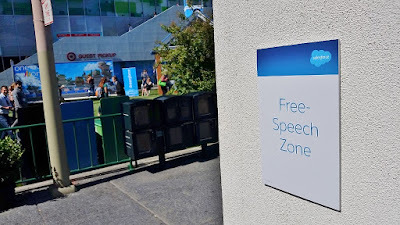 This was the DreamForce Free Speech Zone. No one was there. I don't know what this means. 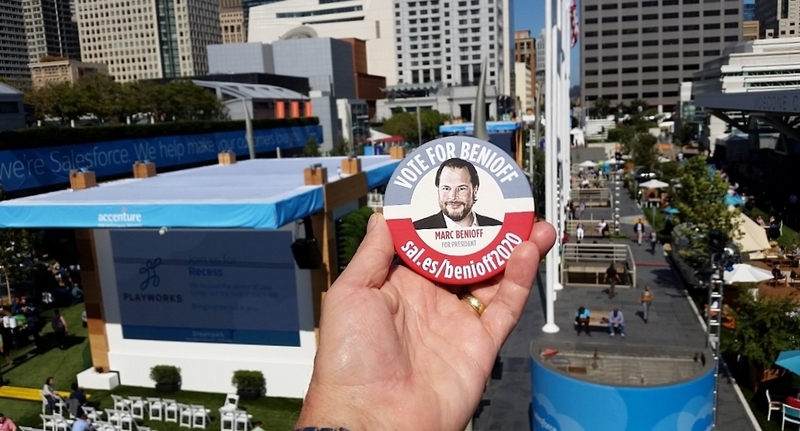 The Marc Benioff for President Campaign. Disturbing. I was very concerned that someone was taking this notion seriously. As it turns out, it was just a Marketing Campaign by SalesLoft. Quite a relief. It was ridiculous because there were plenty of seats, and at 5:00, when the panel discussion began, you could just walk in and sit down. Which I did. About 15 minutes in, finding the discussion to be less than illuminating, I considered leaving. Which I did. A new small startup located in the Presidio, TalkIQ is offering something truly innovative. In this case, I am using the word "innovative" in the old sense of something unique, new, and possibly game changing. As opposed to the more common use of "innovative" as a mandatory adjective for every company and product on the planet. I mean - How many "innovative" Configure, Price, Quote application companies do we need? But I digress. 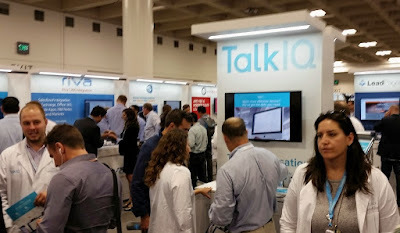 They claim their product will listen to your sales call, transcribe it real time, analyze it based on their "conversational science" algorithm, update your SalesForce opportunity account, and send a report to you and your boss. Kind of Orwellian (as all good software is these days), but also potentially a real time saver, sales acceleration and sales skill improvement tool. I have a hard time believing it actually works, but then I have a hard time believing that "Siri", "Cortana" or even "Okay Google" work as well as they do. One to watch. I only went for one day. One day was enough. The Celebrity Cruise ship "Infinity"- renamed "Dreamboat" served as a temporary hotel for the event. Here the relieved ship and crew sail out of San Francisco Bay after disgorging 1,100 attendees. That's a great photo essay, and it was a kick tagging along with you for a bit in Real Face Time. The company I worked for in Silicon Valley providing internet security made completely Orwellian software too, except most of it was directed at tracking and monitoring and firewalling every keystroke any of your employees might make.